Robert Salanitro specialized in children's book and illustrations with humors; he worked as a freelance cartoonist for Canada Pharmacy Online. According to research erectile dysfunction drugs like Viagra has helped against high altitude sickness. Viagra works by relaxing the blood vessels, allowing more blood to flow freely through the vessels. 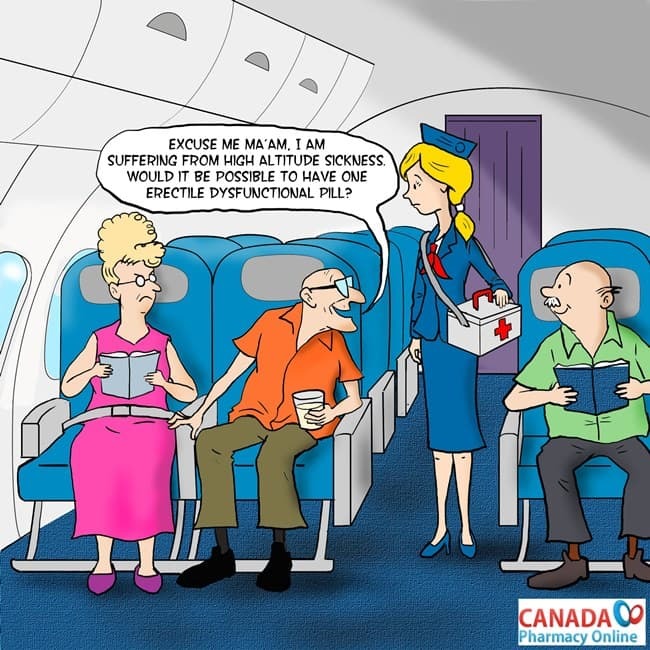 It wasn’t until one day Oscar, a senior citizen, came across a scandal in a newspaper article which stated that erectile dysfunctional drugs were used on airplane flights from New York City to Florida to help prevent altitude sickness. This gave Oscar an idea! One day while Oscar was eating his morning breakfast, he asked his wife Ethel if she would like to get away from the bitter cold weather in New York City and travel to Florida for the week. His wife was excited and she said, “of course that would be wonderful!” So that day Oscar made all the travel arrangements, booked a hotel and the airplane. After a few days Oscar and his wife were off to sunny Florida. While waiting on the line to check in at the airport, Oscar happened to see his friend Burt. Oscar said to his friend “I had no idea you were traveling to Florida?” His friend whispered in his ear and said “ Don’t tell my wife but I read in an article that these flights were giving out free Viagra”. Oscar just smiled and said “Yeah, I know all about it, that’s the reason I am taking this trip too”. As it turned out the plane was filled with senior citizen men and their wives. Of course all the men had smiles on their faces. We hope you found our cartoon funny. Feel free to grab this code and share the image on your website or blog.